When we make friends our stories come out slowly. As we get to know one another, we learn each other’s favorite foods and songs, pastimes and passions. Most people love ice cream…but the Life Story will alert you to the rare person who doesn’t! But persons with dementia, especially those who live in memory care, may not be able to recall or share their own stories. 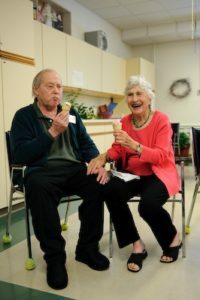 And their care partners may be juggling so many responsibilities that they don’t have the time to sit down and listen. This is why the Life Story matters. It summarizes the most important elements of a person’s life. With those facts in hand, it’s easier to build relationships, smooth over rough spots, and make good times go even better. Supposing a resident standing by the exit insists, “I want to go home”. He may think he is not at home, or just want to get back to where things make sense again. If you know that he worked for the airplane manufacturer Boeing, asking, “Is it true that you helped design one of the biggest planes in the world? Tell me more” can help gently redirect him away from a gate leading to a busy street back to the country kitchen where he can have a cup of coffee and talk about it. The Life Story can help the person to remember certain names, places, and things, and even past achievements. Sometimes just knowing a few favorite subjects—her childhood in Santa Barbara or his college days in New Orleans—can make everything better. Life Stories can also help us better understand behavior (he never liked crowds) and teach us subjects to avoid (a war experience or loss of a child). Unless the Life Story sits forgotten in the charts, where no one can read and use it—or was never completed in the first place. That strikes me as funny. To be admitted to a program, a person needs a TB test, medical reports, and on and on and on. Virginia Bell and I feel that the Life Story is just as important. What if a resident moves into assisted living on Friday at 4 pm, and things go wrong on the weekend? Fortunately some very simple steps can help you bring those important Life Stories back into circulation. create a two or three-person Life Story committee to work together each time someone new comes to the program. Make sure the completed Life Story is accessible – in a binder or small note cards in each person’s name. Be careful with the trend towards electronic records. Sometimes they make Life Story information less visible for staff. Use the Life Story throughout the day to build caring relationships. Greet a resident who lived in Hawaii with “Aloha.” Whistle a musician’s favorite tune during meds. Doing simple things inspired by the Life Story can help people feel safe, secure and valued. Use key facts about people in staff meetings. Add a trivia question like “Who speaks five languages” to your daily standup. Play a Jeopardy game using Life Story facts at a monthly staff meeting. This reinforces information and adds some fun to Life Story work. Take the first week of every quarter to update all the Life Story forms in your program. Create a simple Top Ten card for each resident and distribute it to new staff members to quickly bring them up to speed. Creating the card can also be a good team-building exercise. If you work in a dementia care setting that is not fully on board with Life Story work, you can do your own. In just five minutes, you can learn a person’s favorite color, foods, and music, whether he or she likes dogs or cats (or hates them! ), and where he or she was born. Once you make these discoveries, use them throughout your day to engage the person. The Life Story is an important part of the Best Friends™ Approach to dementia care. We know that if you can help a people feel safe, secure and valued , challenging behaviors go down, and cooperation goes up. That’s what the Life Story can do, while fostering relationships, happiness, and feelings of community. Writer, speaker and long-term care consultant David Troxel is co-author of six books on dementia care, including the recently published second edition of The Best Friends™ Approach to Dementia Care.